Our first Masters graduates proudly claimed their parchments at University of Winnipeg Convocation in 1992. We now have 138 graduates. Since the Masters of Marriage and Family Therapy program attracts more applicants every year, we anticipate our Alumni will continue to grow. Our graduates have been and continue to be the best advertisement for the MMFT degree; impressed by their clinical competence, more and more employers every year cite this credential in their advertisements for jobs. 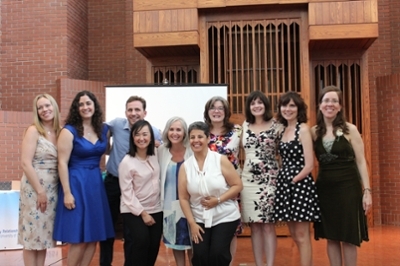 The core of our Masters training is the clinical work under supervision: our graduates complete at least 500 hours of therapy as part of their degree, and are encouraged to continue in supervision after graduation to reach the 1000 clinical hours needed for American Association for Marriage and Family Therapy Clinical Membership. Through this process alumni also become members of the Registry of Marriage and Family Therapists in Canada. Our alumni work across Canada; about three-quarters are in Manitoba working in service agencies, in government and other EAP programs, in schools and colleges, and in private practice. We try to keep in touch with our graduates, and occasionally officially invite them to tell us where they are and what they’re doing. Our most recent information suggests that the majority of graduates are employed in the non-profit sector, where the work includes addictions, child welfare, and family therapy. Some are in government positions at both the federal and provincial levels doing work with First Nations, employee assistance, and addictions. A small number are employed full-time in hospitals (for example, one in emergency doing family therapy and another doing family and child assessments). There are also graduates working in educational settings, at university, college and high school levels. One college teacher is in the related field of early childhood daycare and another is teaching in a nursing program. Of note, two graduates had the jobs they held prior to and during their studies either fully or partly reclassified to recognize their family therapy degree and work. 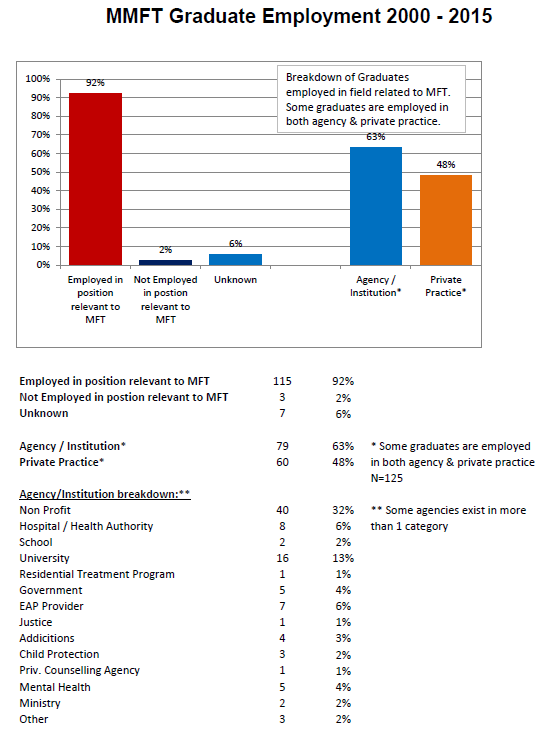 About half the graduates reported that the MFT degree was not required but likely helpful in getting their job. Most were satisfied with their financial compensation. A significant number of our graduates are in private practice, either full-time or in combination with work in agencies or with an Employee Assistance contract. The major frustration of alumni trying to build a private practice is the lack of recognition by third party payers; marriage and family therapy as a separate and credible profession is much more recognized in the United States than in Canada, so the need to lobby for public recognition, health plan coverage and government licensure continues. If you’re a graduate who would like to send us an update on your current situation, or have comments about the process towards recognition of the profession that you would like to share with fellow graduates through this website, please contact mftinfo@uwinnipeg.ca.